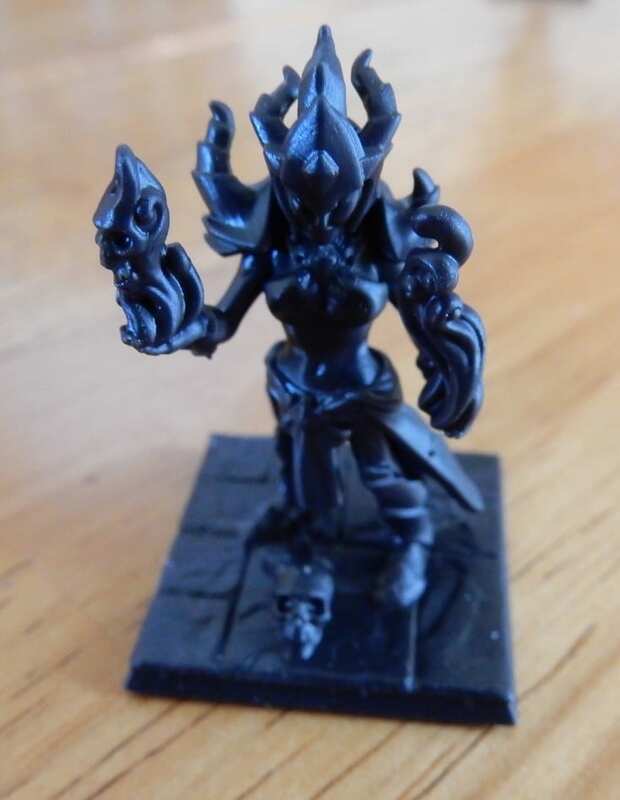 3D printing is the most disruptive thing to hit the game industry since Chinese outsourcing. Buying physical miniatures will go the way of slide rules, milk delivery, and coal chutes. This will kill companies that are unwilling to adapt (cough…Games Workshop…cough) and others thrive in a new world of selling designs for printing. That said, 3D printers are too expensive and technically challenging (current home versions need a lot of tweaking and maintenance) for most people to consider owning. The solution is to outsource the printing. Shapeways is one of the largest 3D printing outsourcing companies and they had a booth at Gencon 2017. They kindly provided me with some samples of their capabilities. 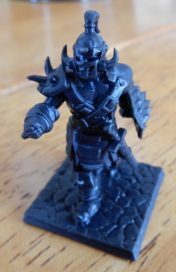 These particular miniature models come from Heroforge.com, but printed by Shapeways. They are standard 25 mm tabletop miniatures in a high-resolution plastic. With a coat a paint I suspect no one could spot the 3D printed miniature against standard injection molding. And you can customize them! Shapeways also works in metal. 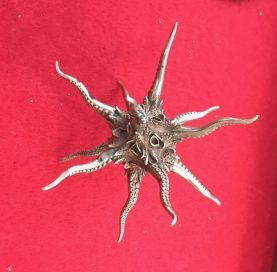 Check out this “Kraken D20” in brass! This d20 is 3 inches from tentacle to tentacle and is absolutely amazing. Be warned though, metal is significantly more expensive than plastic printing, but the material choice is up to you. That said, I suspect prices will drop in the next few years as the technology develops. 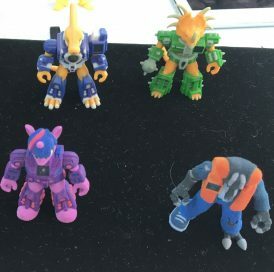 If you are interested in something a bit more fanciful (and cheaper) Shapeways also has some colored plastic options for printing. The set below is unpainted. It does concern me I will see a flood of hot purple paladins at my next RPG game! Finally, every tabletop game needs dice! 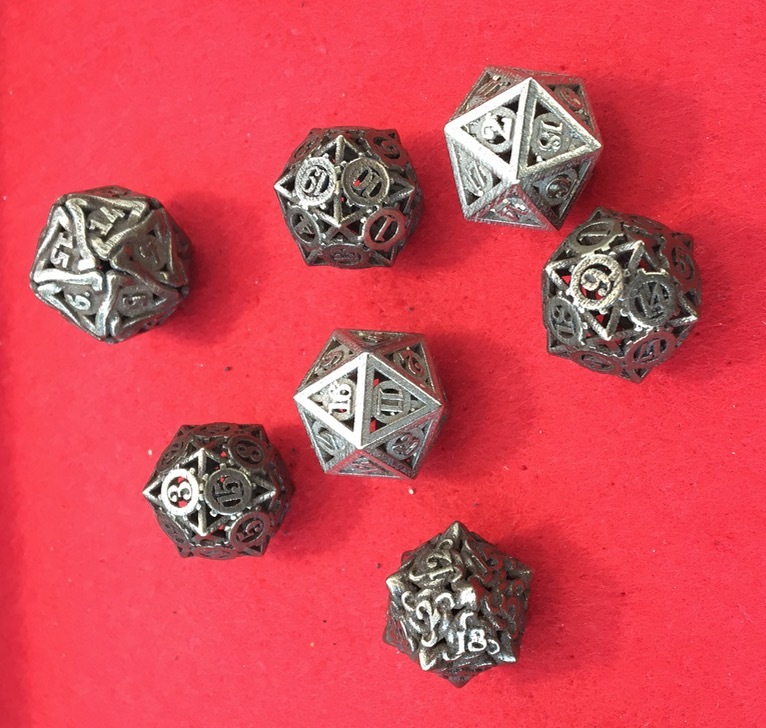 These are a mix of brass and steel print options in a standard d20 size. 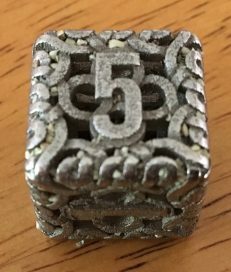 Here is a shot of a sample D6 in steel. It is hollow and quite light. 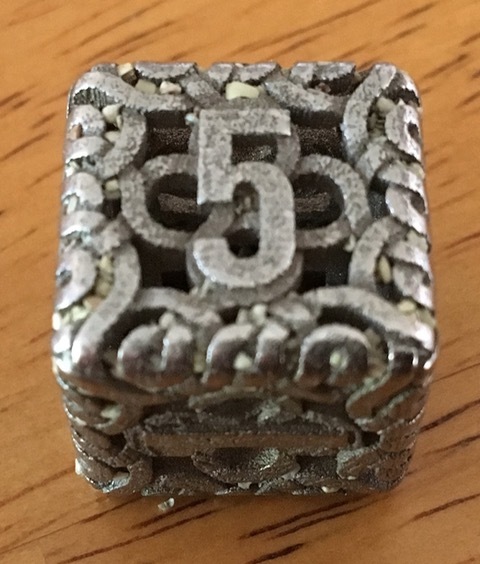 Note the lighter colored “stones” embedded in the die. These are part of the printing process and came right out with a quick brushing. Polishing the dice would likely bring out a nice shine, but I liked the dull, matte finish. The texture is still a bit rough in case you are looking for perfectly smooth. I am very impressed with Shapeways offerings and I think they will continue to disrupt the tabletop gaming industry. Hey, I know I missed this when it first came out, but thanks for the shout-out on the Kraken D20! I work hard on every design, and it means a ton to me that you like it!